The Minnesota Iceman is a purported man-like creature frozen in a block of ice and displayed at state fairs or carnivals in and around Rollingstone, Minnesota, and Milwaukee on and around December 17, 1968 as a "missing link". 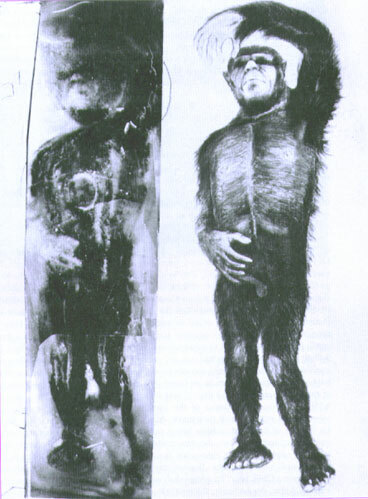 It has been described as male, human-like, 6 ft tall, hairy, with large hands and feet, very dark brown hair about 3 - 4 inches long, and a flattened nose. One of its arms appeared to be broken and one of its eyes appeared to have been knocked out of its socket, allegedly by a bullet that was supposed to have entered the animal's head from behind. If a genuine animal, the specimen would be a significant zoological discovery, as some have suggested the creature was a neanderthal, Bigfoot or Yeti, while others contend that it was a hoax. Ever since Finley laid eyes on the Iceman it has inspired his art. 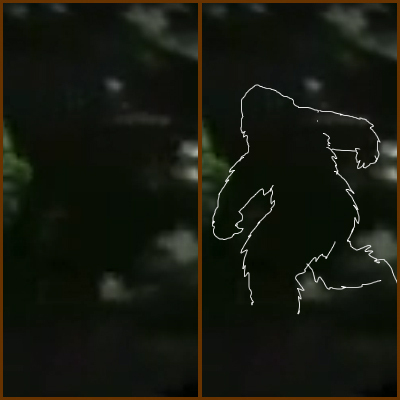 As the article continues, it ends with a request from the sergeant to contact him so he can more accurately produce Bigfoot with his paint and canvass. When writing the stories about Michael Greene’s Bigfoot hunt in conjunction with Animal Planet, I had no idea where they would be read. Retired Air Force Sgt. Thomas Finley, now at home in Essex, England, wrote me for more information. 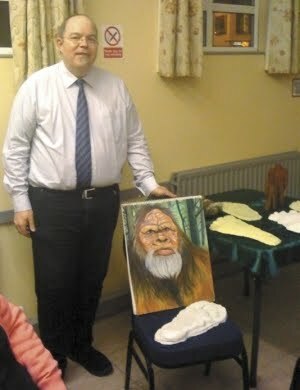 He also sent along two of his own paintings of Bigfoot. Finley is also a Bigfoot hunter. 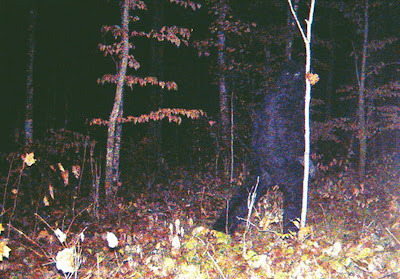 He has been interested in Bigfoot since a visit to the Olmstead County Fair while a youngster in Minnesota. There was a creature frozen in a block of ice called the Minnesota Iceman, and it was purported to be a Bigfoot. “As a child of eight, I was afraid that the ice would melt and the creature would get me when I was sleeping,” said Finley. His interest continued through high school, and he once wrote to the FBI about the “Iceman” case. An FBI agent called the house and asked why he needed the information. Finley’s mom told the agent that her son was just 15 years old and was writing a paper for school. Later, when Finley was interviewing Cuthbert Otten, a mechanic for the famed Flying Tigers of World War ll China, and became even more intrigued. Otten told him of an encounter with a large hairy, man-like creature near the edge of an airfield. 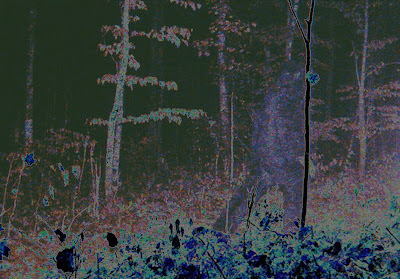 The Chinese forces on the base called the creature a “Forest Demon,” and said it was bad luck to see one. The next day, Otten rode off into the brush with his friends looking for the creature with Thomas machine guns. They didn’t find him. Finley is a disabled veteran who formerly worked a sensitive job for the military. He now lives in Essex, England, with his wife Nicola and they have two grown sons. Finley works for an international charitable organization. He has been an artist his whole life and loves to paint Sasquatch, or Bigfoot. Finley has not seen one up close, but is looking for someone who has so that he can do a better portrait of one. One of his hobbies is collecting personal accounts from people all over the world who have had experiences with the paranormal, Bigfoot and other mysterious animals and UFOs. Currently Finley’s favorite quote comes from an Osage elder who was asked about his tribal belief in Bigfoot. “Just because you cannot see him in the forest doesn’t mean he is not there,” said the elder and Finley believes these are good words to live by on the subject. He also had a few unusual words seldom heard from a Bigfoot enthusiast. “Personally I hope that Bigfoot is never found as it would mean an end to a great mystery,” and then continued “When painting Bigfoot it should be noted; a Bigfoot a day keeps the doctor away.” Finley says “I am not an expert, but I am interested in the accounts people have of these beings. It sounds like fun to me, and I’m sure it will be for Mr. Finley also. I hope gets some good information. 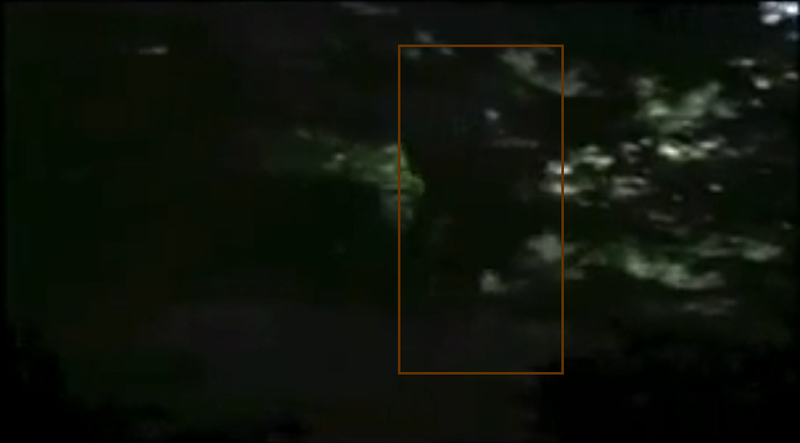 Minnesota ABC Affiliate KSAX-TV files this report of a Minnesota Bigfoot. It has some of the same things we have come to expect from a news article about Bigfoot. It starts from the perspective of a "skeptic", the "no bear skeleton ever found" defense, and a couple of "true believer" anecdotes. Sorry to sound so unenthusiastic, but these articles are getting formulaic. Other signs Bigfoot exists include branches plucked straight out of trees, strange looking shelters, and stick men to warn other Bigfoot of humans in the area. 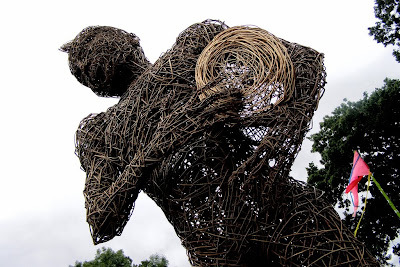 We have not heard of the bigfoot using stick-men to warn other Bigfoot about the presence of humans. We looked in our library and found bigfoot described as a stickman by Native Americans and we have even heard of odd stick formations, but nothing as specific as this news article. Feel free to enlighten us, fans, we would love to hear more about any other stick-man stories.